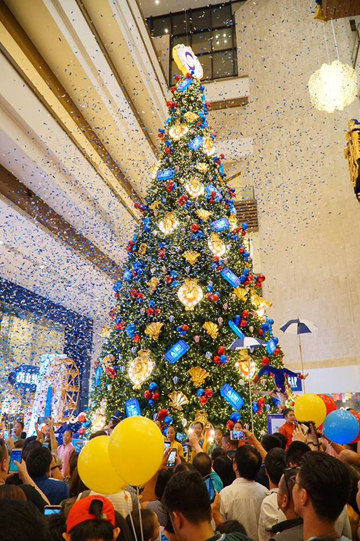 Christmas is fun and magical at Shangri-La Plaza. THE GREATEST SHOW ON EARTH. 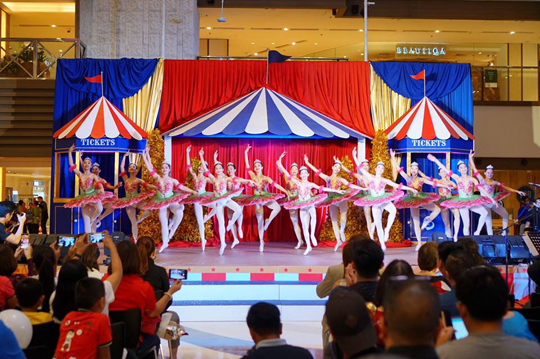 Ballerinas perform during the Christmas tree lighting ceremony of Shangri-La Mall whose theme is inspired by the circus. The premier mall is all decked out in holiday trimmings inspired by the circus. The mall’s entrances turn into revolving carousels to welcome mall guests, while the Grand Atrium offers a breathtaking scene of acrobats, hot air balloons, and colorful balls and banners, suspended from its high ceiling. The 50-foot Christmas tree at the Main Wing features circus-themed decorations, such as hot air balloon ornaments, deck of cards, Ferris wheel, and acrobats. The East Atrium beckons with twinkling lights, gold tinsel, and tassels; while the grand 50-foot Christmas tree at the Main Wing, which was lighted on Dec. 1, offers an “Instagrammable” spot with its striped hot air balloon ornaments, deck of cards, Ferris wheel, and acrobats, topped with a lighted marquee. Aside from circus characters, Santa’s present at the mall, too. Children can find out whether they were naughty or nice this year at Santa’s Corner, located at the hallway by the Rocky Mountain on Mid-Level at East Wing. Mall-goers will be entertained with musical performances happening in December. Catch the ABS-CBN Philharmonic Orchestra with the Ateneo Chamber Singers, indie folk band Ben&Ben, the Philippine Madrigal Singers, Karylle, and various choir groups as they serenade mall guests throughout the month. The Grand Atrium offers a breathtaking scene of acrobats, hot air balloons, and colorful balls and banners. As Christmas is the season of giving, shoppers can take the opportunity to help less fortunate children through Grant a Holiday Wish. They can purchase Christmas angels handcrafted by local artisans from CCAP for only P200 and hang these on Christmas trees—proceeds from sale of the handcrafted ornaments will go to Unang Hakbang Foundation, which aims to nurture and empower children from underprivileged communities. Shangri-La Plaza also proves that it’s truly the gift that keeps on giving with the Rev Up Your Style raffle. Several sleek and stylish dream rides are at stake, including a 2018 Mini three-door Hatch Cooper, a 2018 Mini Convertible Cooper S, and six 2018 Vespa S125s. Every P2,500 single receipt purchase at the Shang entitles shoppers to one raffle coupon. Purchases from Nov. 16 to Jan. 6, 2019 will be included in the first raffle draw, while those made from Jan. 7 to Feb. 17, 2019 can join the second raffle draw. Call (02) 370-2597/98 or visit www.facebook.com/shangrilaplazaofficial for inquiries and more details.